Megillot Esther in a variety of qualities and prices. The prices range between NIS 5100 and up to twice that amount, and sometimes even more. The actual writing can take between two and three weeks and the price is determined by the beauty of the script and the size of the parchment. We will email to you several writing samples and their prices to suit your budget. We have several megillahs in stock, or you can order one tailor made to your specifications. There are those who request a "Megillat Hamelech" and those who prefer not "Hamelech". The unique beauty of the "Hamelech" Megilla necessitates unevenly spaced letters. Below you will find related products. 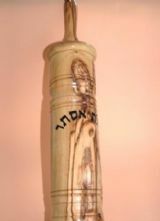 You can also order a wooden megillah case. 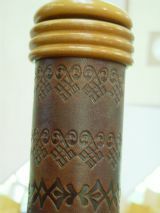 Wooden designer case. Megilla slides out during reading. Hard leather designer case. In a range of sizes.